I hear these words all around. The question itself is not a bad one. I wish the context was different. “What if” I get fired? “What if” it doesn’t fit? “What if” I make the wrong choice? “What if” I don’t know any other way to go? “What if” it doesn’t work? What usually follows “What if?” is negative. “What if?” we were to turn that around? “What if” it doesn’t rain? “What if” getting fired opens up new opportunities for you? “What if” it’s too big? “What if” the choice I make is someone else’s Significant Encounter? “What if” the way I go is far more glorious than the way I’ve always gone? “What if” it does work? As you can see, it is only a matter of reframing our words. 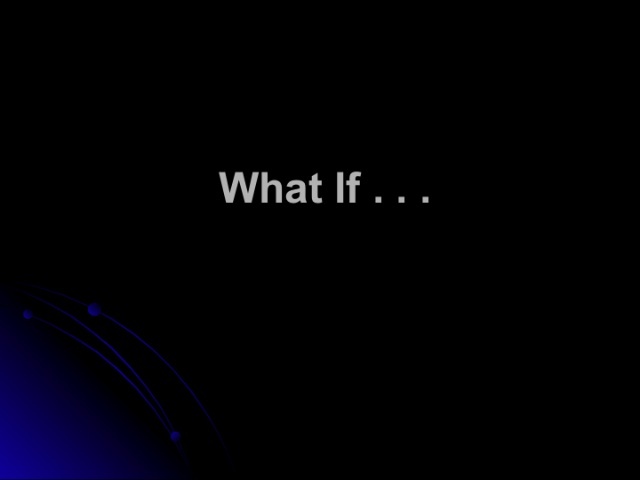 is designed to show only the downside of “What if”. Insurance companies count on “What if”. Our discontent stems from the fact that we only see the dark side of things. I’d like you to try an experiment with me. For a week, just a week, try posing your “What if?” questions in the positive. See how you feel at the end of that week. Is your positive “What if” attitude being contagious to those around you? Is your atmosphere beginning to change? Are you feeling a little lighter inside? Healthier? I’ve spotted three verses from Proverbs citing this reaction. Proverbs 15:30 says this; Light in a messenger’s eyes brings joy to the heart and good news gives health to the bones. In Proverbs 17:22 you’ll find this; A cheerful heart is good medicine, but a crushed spirit dries up the bones. I for one am tired of negative “What if” trying to dry out my bones. I want my heart to think better things. Tell us in the comments one “What if?” that you can change this week. “What if” they all comment and we can learn some new things? From the past. Even more relevant today! We are only beginning to learn about “Kingdom Living”.